Just started using MaxDPS a few days ago as I am a returning player trying to get into the swing of things again. I understand how Feral Druids work but the specifics was lost on me, hence me picking up this addon. One thing I have noticed is that it doesn't snapshot Rip, which is kind of a big deal because it increases DPS by quite a lot actually. In my testing it raised my DPS by about 200-400 playing manually vs following MaxDPS. For instance, for me with no buffs Rip does 288 every 1.1 seconds. Full snapshot it does 415 every 1.1 seconds. If I wait for it to tell me to cast Ferocious Bite, but instead Tiger's Fury > Bloodtalons > Rip for a max snapshot Rip then follow along with MaxDPS it does keep it refreshed via Ferocious Bite. It just never recommends snapshotting it is the problem. Feral Druid is the only class and spec that still has snapshots. 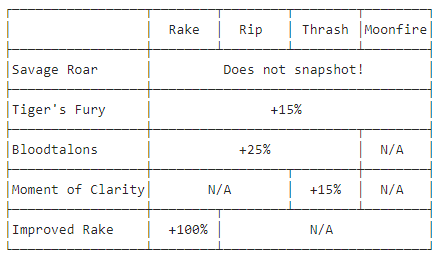 In 8.0.1 they removed some of the snapshotting, but the chart below is the current snapshots that still exist. Moonfire really doesn't matter, but snapshotting Rake and Rip with Tiger's Fury and Bloodtalons makes a very noticeable difference in DPS. Well then open up druid module (main.lua) and check how this can be improved. I am not a Druid player. Well I'm no expert by any means. After looking at it for a bit I think it's pretty doable but I'm really not sure how to explain it because I'd be writing you a book here. I did find this bug while reading through the feral section though. With Feral Frenzy talent selected it will tell you to cast it even when its on cooldown, which makes it stall for 30-40 seconds. That fixes it. Yeah so before my last post I was staring at that for a while. I have a weak aura that applies a multiplier value to Tiger's Fury, Bloodtalons and Stealth Rake. Tiger's Fury would be 1.15 and Bloodtalons 1.25, combined would be 1.40. So say you cast Rip with only Tiger's Fury, it would be 1.15 but then next time it loops through and you have Tiger's Fury and Bloodtalons up, it would be worth recasting for a higher snapshot. Currently as a player that understands those mechanics, I know that when it asks me to cast Ferocious Bite, because of my weak aura that keeps track of my snapshots I can tell if I should actually do that, or if I need to up my snapshot on Rip. Personally I use Sabertooth, which makes Ferocious Bite refresh the full duration of Rip regardless of pandemic and it maintains the snapshot. So once it's snapshotted to it's max potential you can just Ferocious Bite if you have that talent. If not Ferocious Bite is rarely casted, as you would need to Rip with your combo points quite often. tldr though; Tiger's Fury and Bloodtalons need a base multiplier value. When you cast Rip you check your auras for those buffs and set them to a Rip variable. Something like "ripsnap". When it loops through if it should cast Rip or not, it would want to check your current buffs to get a total multiplier value, and compare it to your current value (ripsnap) to see if it would be higher. If it's not higher you would just pass it. That's how it would work with Sabertooth though, it would be different if you didn't have it. You also have the issue of target swapping and how that all works I'm not sure, but the weak aura I use manages it some how. Would be so much easier if the spell ID changed depending on it's strength. Also as a side note. Whenever I change zones, login or change a talent, it spams "Shits not working" in chat for a while when I get into combat. If I just white damage for a while eventually it fixes itself. I haven't tried other specs or any of the other rotation addons. Just Druid and just in Feral spec, unsure if it's an overall bug or just this spec. It's very annoying though and makes the addon hard to use in general. No lua errors or any other info though.